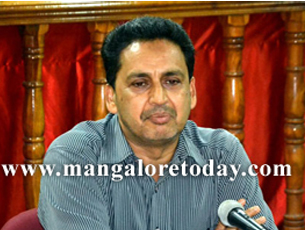 Mangaluru, July 31, 2015: Chairing a preparatory meet DK DC Adoor B Ibrahim said that the three volumes of Mangaluru Darshana will be ready by October. At the meet in this regard at MUDA office in Mangaluru July 30, the DK deputy commissioner said that of the total project cost of Rs 50 lakh, Rs 31 lakh has been contributed by various bodies including government departments, banks and the local administration. Rs eight lakh has been spent so far. The Mangaluru City Corporation has sanctioned Rs 25 lakh and has released Rs 10 lakh, the department of Kannada and Culture has released Rs 10 lakh, SEZ has provided Rs five lakh, the Syndicate Bank has contributed Rs one lakh and so on. DK DC Ibrahim further said that the district administration plans to bring out 1,000 copies of Mangaluru Darshana and tenders towards printing will be invited in near future. The editorial committee Chief, Prof B A Vivek Rai said that the history of Mangaluru from first century AD till date will be covered under the Mangaluru Darshana and various aspects such as geography, rule of royal dynasties, foreign rule, education, sports, commerce, arts and culture would be covered. Field works and interviews with veterans have been done in this regard. All the information is being compiled and the project will be given a final shape by August end, Vivek Rai added. Editorial committee members Muddu Moodubelle and Satyanarayana Mallipattana were present.